MMD National Secretary Raphael Nakacinda has advised the media to stop pushing politician into what he termed as the battle for power. And Mr Nakacinda says the duty to prepare the MMD President for the presidency is the responsibility of his Party, the MMD and not any other Party. 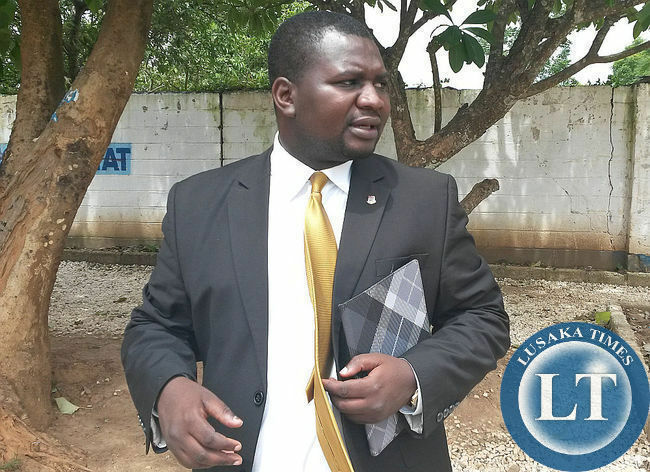 Speaking when he featured on Muvi TV’s the Assignment Program Mr Nakacinda observed that there is a tendency by the media to push politicians into power play and that it is detrimental to the development of the country. He said there is no need for politicians to continue fighting after elections because time for campaigns ends the day before the elections day and that offering checks and balances does not mean being confrontational. He explained that it has become common for the media to interrogate sources from a dramatic point of view as opposed to what is in the interest of the Zambian people. He also added that MMD was better placed to offer checks and balances to the PF government because they are able to sit down and advise each other. “…a person who talks from outside and attempting to influence what is inside and a person who is actually on the table and saying we can’t do this but I think we can attempt to do it this way, because I think it will benefit the Zambian people, who has a higher chance of succeeding? He who is in Cabinet or he who is at the High Court trying to petition the elections results which will never happen. As MMD we are better placed to offer checks and balances and contribute to bettering the lives of the Zambian people. “….I want to advise you the media to stop pushing us politicians into this power play and battle for power because this is what is making us fight. It is not about how I feel but what impact something has on the Zambian people,” he said. And on assertions that the MMD had taken over the PF and that their President Felix Mutati was being prepared for the presidency in 2021 Mr Nakacinda said it is the duty of the MMD to prepare their President for anything and not the PF. He said his party is in an alliance with the PF but that it is an independent party with its own program of rebuilding after what it went through in the past five years. He further said those former MMD members being seen to have swallowed the PF are members of the PF who defected to them and were accepted by the ruling party hence should be considered as such because they are no longer MMD members. He also said it is not in the best interest of neither the PF nor the MMD to destroy each other because it detrimental to not only the two parties but the nation at large as both parties have a role to play in the development of the country. Asked if there is any reconciliation plan with former Party President Nevers Mumba, Mr Nakacinda said he had reached out to his former President but that he has not answered to any of his invitation for reconciliation. He said the MMD was open to welcoming any of its former members but that the Party will not allow anyone with negative energies to come and derail the process of rebuilding the Party. More likely than not, presence of Mutati in the Cabinet its intended to provide “checks and balances” about division of illegally plundered National wealth and nothing else. Four months in to new administration and absolute chaos and incompetence has become norm. There is no longer MMD or PF. Its just a bunch of crooked individuals out to ra?e this country. Bwana Nakacinda should consult Nick Clegg. He has a lot of lessons to share. He is being rude to upnd. He also thinks mmd is better placed than any other party. MMD, a pushover party whose structures are weakly established can hardly keep checks and balances. Its role is just to fulfill the wishes of its controller party PF. A mere swing party which lost touch to the reality. Realign yourself first and everything else will follow. How many MPs and councillors does MMD have these days? MMD is going the way of Unip – into oblivion. Govts of national unity don’t work – all Morgan Tchangirai from Zim or Nick Clegg of UK. The smaller party is just abused so that the main party wields power. Crazy talk….can he vote in parliament??????????????? ?